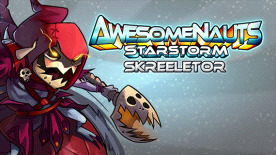 This DLC contains a custom skin for Skree in Awesomenauts, and comes with a fully customized voice set! © 2012 Ronimo Games. Ronimo Games and Awesomenauts are trademarks or registered trademarks of Ronimo Games.